Today is New Year's eve and like last year I am spending the day reflecting on the past 12 months. Later tonight I will honor Frau Holle and see the old year out while welcoming the new in, but I find that the best way to let go of the past year is to really look at what it has taught me. Often it seems that there is an underlying theme to each year; in 2011 it was loss and endings. Fittingly 2012 seems to have been about both beginnings and limitations. I am not a patient person - once I set my mind to something I tend to put all of my energy into it and I want to see results. This has usually been a good quality, but this past year I found myself repeatedly being in situations were I was forced to go slowly or which took longer than I wanted. This has, overall, been a good thing as I have learned to take life slower and enjoy the experience more while anticipating the end result less. Learning to see limitations in a positive light has definitely been a good thing and I think I am less concerned about other people judging me by what I do or produce, and more concerned with making the most of what I can do. This year has also brought several great opportunities related to my writing. I have been putting more energy into this blog, and have also started blogging for a local ecumenical website, as well as being offered an opportunity to blog once a month for another site. I wrote several books this year, from my own poetry book to a children's book on the Fairy Faith, and have a book on Druidism coming out within the next few months through Moon books. I'm definitely proud of all these accomplishments, and I feel that writing has helped me focus myself as well as sharing different views and information with others. Spiritually this year's challenges have helped me better understand my own views and faith. Whereas in 2011 I felt rather adrift and lost spiritually I think that has been resolved this year, although it took me being willing to go back to the very beginning of my spiritual path and really take a hard look at not only what I believe and why, but what is the most spiritually fulfilling for me. I had drifted into a place where I was letting other people's expectations and needs direct where I was going rather than following what made me happy. That was a mistake, and while it took some serious misery in 2011 to make me see that, in 2012 I have channeled that in a positive way. It isn't just that I accept my own liminality now, but also that I embraced it. 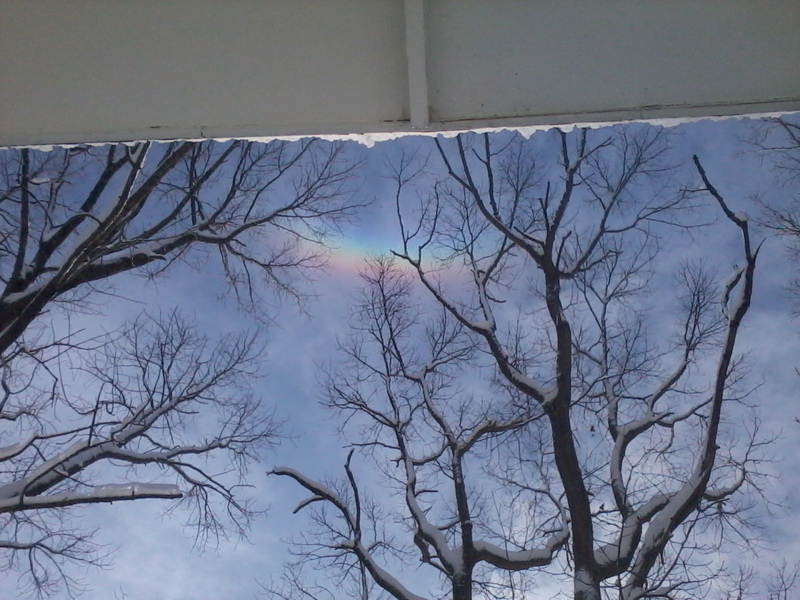 I went out yesterday, after my area was gifted with 8 inches of snow from Winter Storm Freyr, and looked up to see a rainbow shining directly above me house. 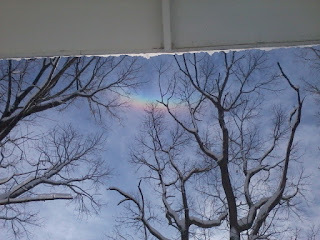 I feel that this can only be a good omen for the year to come and I am excited to see what 2013 will bring. What has been the theme for your year? Are you ready to move forward into a new year? On Sunday, December 23rd, one of the strongest, most intense, women I have ever known passed from this world to the next after a hard fight against cancer. In the past four years she had fought and beat cancer four times, but this fifth round proved insurmountable. My life will forever be poorer without her in it, and I miss her very much already. I met Christine, affectionately nicknamed "Herb Lady", about 7 years ago through my friend's store. There is no one else quite like her, with her ascerbic opinions and take-no-prisoners attitude. At first I couldn't tell if she liked me or hated me but over time I learned that being blunt was her approach to everything; if she liked something she said as much and if she didn't like it then she made that clear. You never questioned where you stood with Christine or wondered if she was being honest with you. Over time it became an endearing quality and I learned to appreciate her unique approach to life. Christine, who was an excellent herbalist, taught me to identify plants, especially herbs, that grew wild in Connecticut. Because of her I know Woody Nightshade when I see it, and can identify Mullein and Mugwort. She also taught me ways to use the things I found, especially for healing and magic. At random intervals she would appear with her arms full of Wormwood, Mugwort or Sage from her garden and talk to me about how to dry and use them. Every year she would bring me homemade smudge sticks, sometimes plain Sage, other times Sage mixed with Rosemary or Lavender, insisting that the plants from her garden were better and stronger than any sold commercially. Several times she brought me cuttings to try to root out - Black Nightshade, Wormwood, Mugwort - and would hover over me as I tried to properly wrap the cut stems in wet paper towel. Sometimes I could get them to grow for me, and sometimes I couldn't, but she never stopped helping me try. Christine was a witch and Hecate-woman. Her recitation of the Witches Rune would raise the hair on the back of your neck and she knew her spellwork like few other people I've ever met. Although I did not always agree with her I had an immense respect for her and learned a great deal about the practical, hands-on, magic she practiced. She could make incense, powder, and spell candles like no one else, and she taught me how to use these things in new ways. Because of Christine I began to think out what I was doing more and make my own ingredients and components, instead of flying by the seat of my extemporaneous pants all the time. In 2006 Christine, who followed a blend of modern Wicca and her own family style witchcraft, asked me if I wanted to be initiated as a priestess of Hecate; this was an enormous compliment from her, as she might occasionally offer to initiate someone she had taught into witchcraft but rarely acknowledged that a person was already a witch; deeply honored I said yes. Although I have no other connection to that pantheon and my own focus is firmly elsewhere, I have never regretted that decision and it led me, eventually, to co-creating a Witchcraft Tradition at Hecate's direction. The ceremony itself was deeply moving and, like Christine herself, not quite like anything else I'd ever experienced. Christine made jewelry and spell candles, among other things that were sold at the store. She also often made special things just for me, bracelets and necklaces of stone beads, a ring, and a spell candle dedicated to Macha which she later gave me the recipe for. These tangible reminders of her will be cherished now, as I cherish the memory of every conversation and every kind thing she ever did for me. No one else I've ever met had the same inherent concern for helpless or outcast things. When she found a cat, dying from an infected wound, she took him to the vet, even though he was half wild and she had no money to spare on a stray. When she was out of work she began caring for two elderly sisters who needed someone to check on them and handle able bodied tasks around their home. When her ex husband became sick and needed somewhere to stay she took him in, caring for him in his own final days. And she took my friend and I under her wing with a tough love mothering that was impossible to resist. In many ways Christine was more like family than a friend. When I had a cold she would pull out a mix she called "nose oil", splash some on a tissue, and make me hold it under my nose - and it never failed to clear my sinuses out and let me breathe no matter how stuffed up my nose was. When I sprained my wrist in an accident she appeared with a quart-sized freezer bag full of powdered Comfrey and not only explained how to make a compress out of it, but insisted I do so immediately and wasn't satisfied until I had my wrist slathered and wrapped to her specifications. Every Sunday that I was at the store she would bring me the newspaper and, usually, something to eat, and we would chat about life and magic. Every year she sent my children cards on Halloween and made them gifts for Yule. For many years now we traded witchy-themed novels back and forth, discussing the plots the way some people talk about popular TV shows. Sometimes we chatted about sewing and where to get the best prices on material; Christine was a talented seamstress who sowed some of her own clothes and made everything from dolls to small bags to use for charms. She talked about her past, her husband, her children, as I shared stories about mine. The night her ex-husband died after his own fight against cancer she called me and told me that she felt that Hecate had come and helped him cross, at the end. 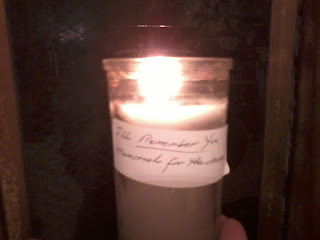 I and another close friend went and visited her a few days before she passed. She was in pain and on a constant morphine pump, but she was happy to see us. She held my hand and wouldn't let go and tried several times to say something, but we couldn't understand what she was trying to say. We sat with her, watching Dark Shadows on a laptop because it was one of her favorite shows. Several times she dozed off, but we stayed until she woke again. She asked a couple times if I was there, and I reassured her I was, all the time holding her hand. Despite it all when she did speak she retained her unique sense of humor and was obviously still herself; I was glad for that. When we finally left I knew it wouldn't be much longer, but the news of her passing was still a shock in a very visceral way. I can't imagine life without her there offering advice, lending me witchy novels, and showing me the herbs that grow all around us. She was a teacher, a mentor, and above all a friend, and I am a better person for having known her. May Hecate hold her; may the Goddess's torches light her way. 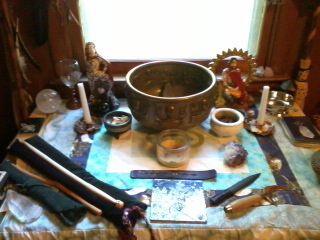 It seems that most modern pagans have or use altars of some type. Sometimes permanent, sometimes transitory, the altar is often the focal point of worship, a place we can connect to our Gods in an active way. A place to go when we need something to focus on, and a place that can act as a base for ritual. This idea is certainly not unique to neopagans, one look at the ancient temples of Greece, Rome, or Egypt show us that altars go hand in hand with some religions. Of course from a Heathen or Druidic perspective the evidence is a little harder to find, mostly due to the difficulty in interpreting archaeological sites. In modern Heathenry and Druidism, however, altars are regularly used and may be simple or elaborate. Some traditions have very specific and detailed altar layouts for followers to use, while others can take a more freeform or organic appraoch to altars; in either case though the altar should be functional and serve the purpose of creating a place of connection. 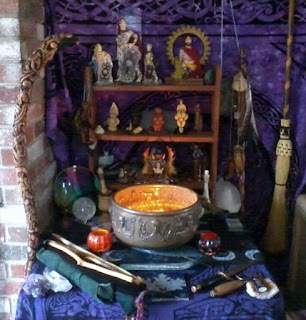 I am lucky enough to have several permanent altars in my home, including one that is dedicated entirely for honoring several healing Goddesses; this altar is where I go when doing any healing magic or when praying for healing. I have decided to share my own altars here and hope that others find it useful to see examples of how one person sets up and uses altars in a modern context. Exactly what is on a modern altar and how the altar is used can vary widely, but as mentioned previously, generally each tradition or faith will have guidelines or expectations for the set-up of an altar. Most altars that I have seen will include sacred images, candles, and a place or bowl for offerings, but some may also include a variety of objects and tools. My own altars tend to get very elaborate as I try to include a variety of things that are important to me, but I have seen some that are as simple as a candle and incense burner. 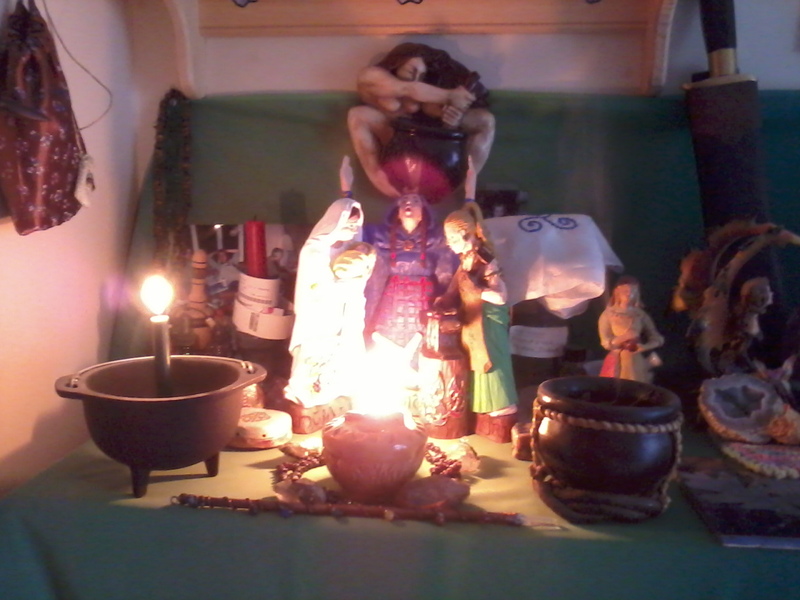 My Druidic altar is probably the most complex of all the altars I have. It includes images of several of the deities I honor, including the three Morrigan, Nuada, and the Matronas. I also include my ancestors and the daoine sidhe, symbols of sea, earth, and sky, my many wands, a ritual blade, mortar and pestles, and a cauldron. Additionally I decorate each altar for the holiday I am celebrating; for example in the picture of my Samhain altar you will see Jack o'Lantern tea light holders. To represent sea, earth, and sky I have three small cauldrons: one holds shells I have collected at the beach, one holds sacred earth from various locations, and the third is used to burn incense in. The fourth and largest cauldron on my altar usually holds a triple wicked candle, but is also used to burn ritual offerings in. 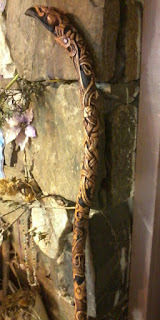 I am very fond of using wands and I have more than half a dozen in different woods and styles; I also have two bronze rituals blades that are used for several purposes including in healing work and for collecting herbs. The mortar and pestles are used for making incense, for the most part. Since we have few details on what, exactly, a Druid's altar in antiquity would have looked like I have given myself a lot of creative liberty in designing my own - the biggest and most obvious difference from what we do know historically is that my altar is inside, not outside in a grove of trees or other sacred place. I do have an outdoor altar, but it is a very simple stone altar, used for outdoor rituals or offerings. 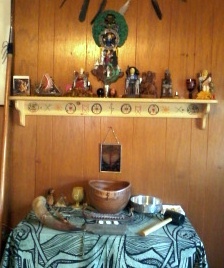 In addition to these large altars I have smaller ones, which I call shrines, for specific deities. These generally consist of an image of the deity of the shrine, votive objects, incense burner, and candles. 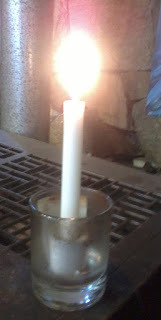 I use these sites to make small offerings, such as incense or candles, to that specific deity. Sometimes I will use these places to pray to or meditate on that deity as well. 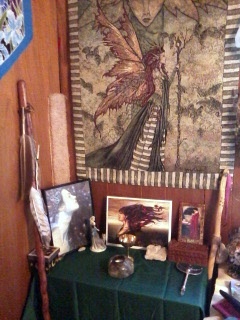 Finally I have altars dedicated to my ancestors and to the daoine sidhe. These serve the same purpose as the other altars but are very specifically focused. I find that they are excellent for connecting to non-divine Powers and go to them no less often as the others. Happy Yule and a merry solstice to all! Yule is always one of the busiest times of year for me; as I mentioned last year I have usually approached Yule form a strictly Germanic/Norse perspective but have recently started trying to incorporate more Irish and Druidic aspects. Since the heathen Yule celebration lasts for 12 nights its been hard to work in anything else - which is complicated by the very limited Irish folklore and practices. This year I am going to attempt to juggle four different types of celebration. Last night I helped run an open neopagan Yule ritual. We gathered and focused on sending loving energy to any who are suffering, to help heal those who need healing after the tragedies of the last week. We also wove bracelets for ourselves while focusing on goals we want to nurture in the coming months as the light of the sun grows. 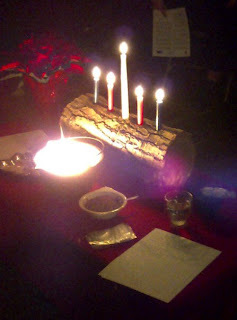 And of course we lit candles on a Yule log in honor of the solstice. Because last night was also Mother's Night in Heathenry my family and I also lit candles for the disir and our female ancestors. We held a small blot to Frigga, offering milk and water to her. We do this in thanks for their protection and also to ask for blessings in the new year. I drew a rune for divination and pulled Othala, which I believe is a good sign of connection to the ancestors, in this context. Today, on the actual solstice, I will honor Grian, in a Druidic ritual. My family will light our Yule log at home, and we will hold our annual holiday movie night, which the children are very excited about. The solstice itself tends to be very family oriented for me, which is a nice break in the otherwise hectic schedule of the holiday. For the ritual to honor Grian we will bake a sun cake, as we do for Aine at midsummer, and offer pieces of it to her and to our ancestors and the daoine sidhe. We will also offer her sugar cookies and spiced cider. It's my Kindred's 6th anniversary this year so we are planning to hold a Yule blot on the 23rd. this is always a very festive meeting with lots of food and good converstaion after a blot to honor Odin as the Julfather. Each year we choose different Aesir to focus on ; last year it was Freyr, and the year before it was Odin and Frigga together. After the blot we each pull a rune to see what our omen for the year to come is, and I pull one for the Kindred as a whole. My Kindred sister, Mel, is an exceptional cook, so feasting is always something to look forward to, and its fun to watch the kids play and enjoy the celebration. In our home this year Santa is arriving on the 23rd as well, with present opening occurring very early in the morning, so on the evening of the 22nd we will be honoring the Julenisse (with porridge). We decided it was important for the kids to have the joy of waking up to presents under the Yule tree and find the idea of Santa very pagan, but we can be a bit flexible on when he comes, looking at a day close to the solstice that we will all be home together. I know that some people who have Odin, as Julfather, come with gifts riding Sleipnir, but by the time I heard of that idea my oldest was already invested in Santa, so we have stuck with what she initially grew up with. After this, leading up to New Year's eve, I will also blot to Frau Holle, Freyr, and Thor, as well as make offerings to my ancestors and the land spirits. And of course I will celebrate a secular Christmas with my extended family on the 25th. On New Year's eve, the official end of the 12 days of Yule celebration, I smudge the entire house with juniper, and at exactly midnight I open the front door to let the old year out and welcome the new year in. I also leave out a small loaf of bread, asking for abunadance and prosperity in the year to come. It will be a hectic couple of weeks, but it is always filled with fun and good food. I hope your Yule is just as much fun, and wish you all a good New Year. In studying the Druids and wider Celtic folk magic one particular type of magic is commonly found - the rosc. Rosc is defined as a rhetorical composition or chant, although the electronic Dictionary of the Irish Language (eDIL) suggests that the original term in Old Irish may have been rosg, because rosc cannot be traced further back than late medieval documents (eDIL). It appears in early manuscripts as rosg catha, referring specifically to battle magic, and later as rosc catha with the same meaning; interestingly rosc also means "eye" (eDIL; O Donaill, 1977). The plural of rosc is roisc, although in modern Druidic vernacular it appears as roscanna; roisc do not generally rhyme but rely on alliteration instead (eDIL). Examples of roscanna are usually seen as battle magics, where the speaker is in a conflict and is using the chant to overcome the enemy in some way; however there are also examples of roscanna used for other purposes such as blessing or sleep. In mythology Druids are said to be able to create illusions, heal, find the truth of a situation, advise, interpret dreams and curse with the use of roscanna (O hOgain, 1991). Reciting a rosc may be accompanied by specific actions, such as when we see Lugh reciting a rosc for his army, while circling them with one eye closed, one arm behind his back, and on one leg, a type of ritual pose known as the corrguineacht. The corrguineacht itself is usually associated with cursing, perhaps relating the pose to the Fomorians who are sometimes described as having one leg, arm, and eye, although the name corrguineacht is sometimes translated as Crane Posture. O Tuathail translates it as Crane Prayer (O Tuathail, 1993). fishful the sea." (O Tuathail, 1993). This demonstrates not only the use of tense but also two other qualities of roscanna: the emphasis on descriptive terms and the repetition of the first line, or a variation on it, as the final line. The descriptive nature of roscanna works with the alliterative pattern; along with the repetition of specific lines this reinforces the poetic nature of these chants. Some roscanna, such as Amergin's Invocation of Ireland also follow a pattern of repeating the end of one line as the beginning of the next line (example below). generous in showers..." (O Tuathail, 1993). "I request my stone of conflagration. Be it no ghost of theft. There are examples of roscanna that rely on invoking a higher power as well, but these appear to be less common. It is possible that the folk magic charms we have today are based on the same principles as the Druidic roscanna, although the modern folk charms more often invoke higher Powers. I am safe, secure, and protected." Yesterday my state was rocked by one of the most horrific school shootings this country has ever seen. As I followed the developing news story I found myself trying to comprehend the horror that the victims and their families were dealing with. As a former EMT and a mother of elementary age school children I was heartbroken by the entire situation, and like many people I wanted to do something. All over the state there were prayer vigils held last night, and maybe prayer is a normal reaction to the sadness and grief of such an event because I also felt like prayer was the best response I could give in that moment. As the days unfold and we all try to come to terms with what has happened, as the debates ensue about why it happened and how it could have been prevented, I hope we all remember to keep the victims and their families in our thoughts and prayers. While the nation argues over the inevitable issues, 20 families are burying their young children, lost to senseless violence in a place that should be safe for all children, and 7 other families are burying their beloved relatives who died next to those children. May you light our way today." 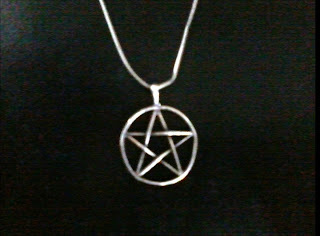 In my experience many pagans have a sacred symbol that represents their belief, if only to them. These symbols may be somewhat mainstream, like the pentacle, or less well known, like the irminsul, but they all serve as a touchstone of the religion or beliefs the person holds. 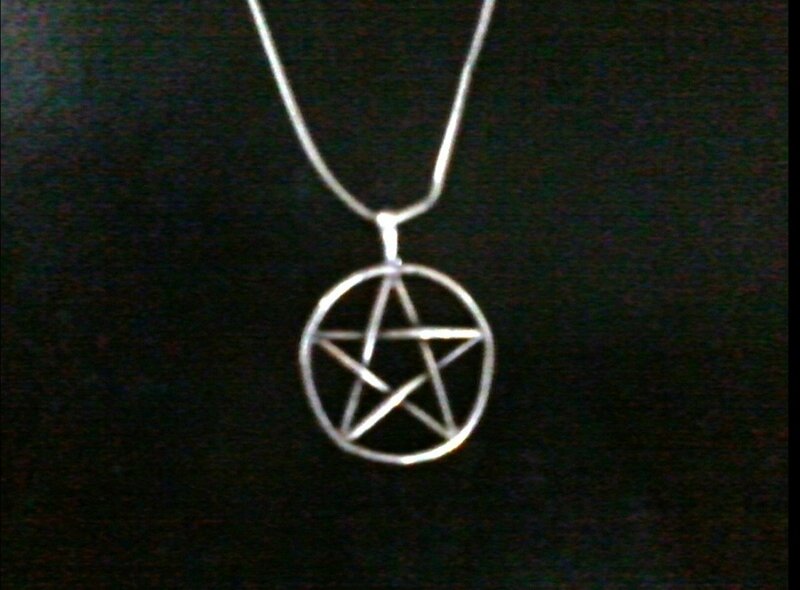 with a short note saying that I have had this pentacle for over 20 years and that to me it represents the interconnection of all things. The picture and explanation appeared in the slideshow accompanying the main article. After submitting it I questioned whether it was the right choice; should I have gone with a triskele instead to represent Irish paganism and Druidism? 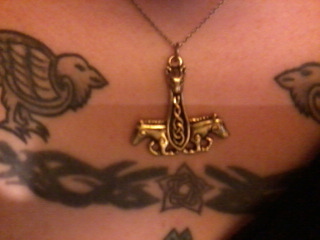 Should I have used an image of my Thor's Hammer to represent Heathenry? Both of these images are very significant to me, and each has a special meaning. 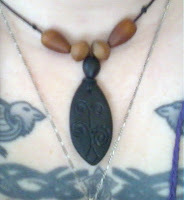 The triskele is something that I feel I earned by going through the fostering process with my Druid Order and symbolizes the connection to sea, earth, and sky; the Hammer was a gift from my Kindred sister and reminds me of my connection to the Gods. So why, I asked myself, did I choose as I had? In the end I believe that I picked the symbol I did because it was the first symbol I ever connected to, the first image that was more than just decoration. I bought this necklace with money I saved up babysitting and I wore it every day through high school. It saw me through some very difficult times, and did indeed always remind me that all things are connected. After I moved beyond the religion that it is commonly used to represent I still wore it sometimes for that feeling of connection. In short this pentacle ceased being a piece of jewelry that stood for one faith and became a personal emblem to me of my own inner strength and the comfort I found in something that kept me from feeling all alone even when in many ways I was. Even though I don't wear it often anymore it is still special to me. 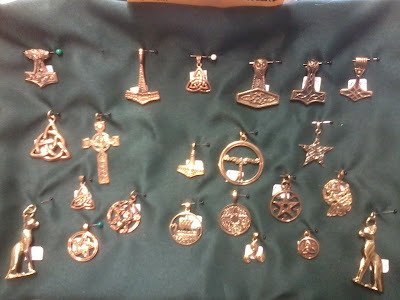 I have a beautiful Thor's Hammer that I wear, and I have a triskele - each is important to me and holds a special meaning. 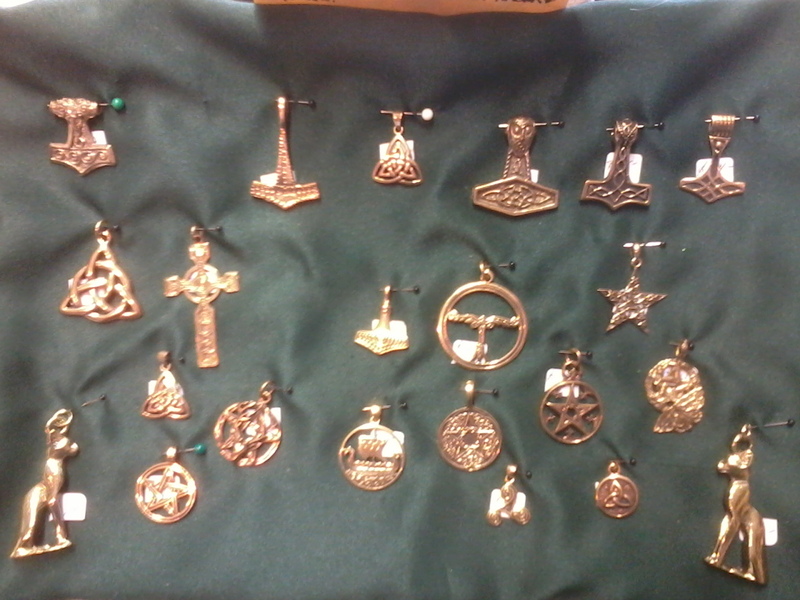 Each symbolizes my faith in different ways. But there is a connection to my first religious pendant that has endured even through changes in spirituality. It's just a simple piece of silver, shaped like a star within a circle, but it is one of the most precious things I own, because to me it will always be a representation of that ineffable connection to the things that matter to me. I also often wear a triskele or a tree to symbolize Irish Paganism or Druidism. Both of these are modern symbols, not having been used historically to represent a pagan faith that we know of, but are great representations of those faiths for modern practitioners. The triskele is seen in ancient Irish art, although its true origins are debated; some believe it was adapted off of the Norse valknut, while others think it is an older Celtic symbol. I also tend to favor wearing a tree emblem as it represents Druidism to me and also encompasses the concept of the bile (sacred tree or pole) and world tree. 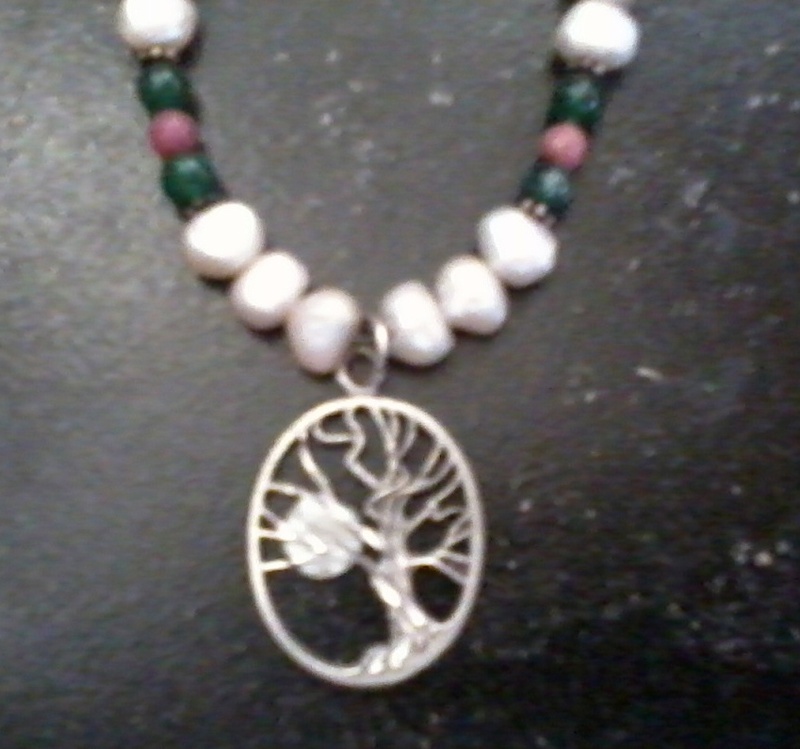 In this way the tree symbolizes both sides of my faith, the Irish and the Norse. It's worth noting that I have gotten tattoos of the symbols I find important including the Thor's Hammer, Valknut, and Triskele, so in some ways wearing them as jewelry is redundant, but I still like the jewelry. In a world and culture were what symbols we wear around our necks are often a subtle - or sometimes not-so-subtle - way to declare our faith publically I tend to appraoch wearing mine as a matter of pride in my spirituality. I tend to choose the symbol I wear based on what I feel most in tune with that particular day, and my spirituality being what it is I often wear more than one symbol at a time. What sacred symbols do you wear? What makes that symbol special to you? I awoke this past Tuesday morning from a very strange dream, most likely rooted in seeing too many previews for the new movie the Hobbit. In the dream I was traveling with a group of dwarves and an elf - picture the ones from the movie and you'll get the idea - when suddenly there was some sort of attack and everyone was knocked out. The earth began slowly growing over each inert form, seeming intent on pulling them down completely, but before the process was complete another elf appeared and woke his sleeping/enspelled kinsman. In the dream I heard a voice saying "They are never forgotten who have family to search for them, and so this one will be reborn again." Then I woke up, but with a strong feeling, not only of the importance of the ancestors to us, but of our importance to those who have passed. This was something of an epiphany for me, because I had previously tended to see my relationship with the ancestors as one where I looked to them not one where they depended on me. My first clear thought on waking was "If I died today how would my children remember me?". I have spent much of the day thinking about that, and about something my husband said to me in a conversation the night before; when I expressed concern about the way I decorate our house being too overtly pagan (being worried that his family and friends feel uncomfortable) he told me not to be a "closet witch". I had never thought before that I was or would be any sort of closet anything; in fact I had prided myself on how open I was with my spiritual choices. It was a wake up call to have him point out, in a supportive way, that I needed to be proud of who I am. So I have been thinking about all of these interconnected things, about the way our ancestors need us, about how my children think of me, and about how I change myself for other people. I truly believe these are all related thoughts, because each comes back to the idea of leaving a legacy worth being remembered for. I can even divide them up by past, present, and future - what my ancestors did to earn a place in my memory and devotions, what I am doing with my children and how they will remember it, and what I am doing and will do to shape my life according to what other people expect my life to be. What my ancestors have done cannot be undone or changed, and it does affect how I feel about them now and who I focus more on. What I do now with my own children becomes that same set-in-stone past tense, and I am suddenly aware of how precious each moment with them as they grow is. And I realized that it truly is my choice to live for my own happiness or to live to meet other's expectations. I am weaving my own legacy, strand by strand, from my choices and actions. When I look at the past several years I see a life out of balance. I went to college and am within 6 degrees of earning a bachelor's in psychology. I wrote six books. I started blogging and have tried to post 2 to 3 blogs per week, and now I also blog once a month for a local faith and values website, as their only neo-pagan blogger. Two years ago I was teaching at local and regional events, and this past year have been teaching locally. I've been a guest on 2 blog radio shows. I am raising two children, one with special health needs, and am married, as well as participating in or running several spiritual groups. I am clearly a very driven person and I have absolutely no idea how I find enough hours in the day to get this all done. But what legacy does it leave? I have no interest in being well known, only in sharing what I know with those who might gain from it, so am I achieving what I want to achieve? Am I giving my children childhood memories of me that are worth cherishing, or am I just getting through each day? Am I doing what I want to do, being who I want to be, or trying to please others? The reality is that I am pushing myself way too hard to meet the perceived needs of other people, rather than simply enjoying my life. In the past several weeks I have been struggling with some health issues that require me to rest; I am failing miserably. I no longer remember how to rest or relax, or simply not do anything. I fill every moment with something, and not always something that is good for myself or my family. And this is not the legacy I want to leave my children at all. I am starting, right now, to change how I do things, what I do, and to get my personal priorities in line with my actual desires. I am seeking balance, trying to remake my life - now - into what I want it to be, something that will be personally fulfilling and worthy of remembrance and honoring when I am gone. In short I am trying to live in the moment, knowing that this moment is only a breathe away from being the unchangeable past and deserves to be spent in the best possible way. What will your legacy be? Will your life end with satisfaction with how you lived it, or regret for focusing on the wrong things? As with my earlier post in August on Irish pregnancy traditions there is not a lot of information to be found on traditional pregnancy practices in the Norse. One possible explanation for this that like many cultures of the time period a child was not seen as person until they had survived a certain amount of time after birth and been recognized or acknowledged by the family, particularly the father (The Troth, 2007). This is logical given the high rates of infant mortality, and also allowed for the newborn to be killed or exposed if it was unwanted, sickly, or unacceptable to the parents (after being officially acknowledged such actions would be treated as murder). Although extremely harsh and unacceptable to modern heathens such infanticide of newborns was a widespread practice in most, if not all, ancient cultures. The result of this for a modern heathen seeking traditional pregnancy practices may be that there just isn't that much to be found, although there is more in the category of birth practices and child blessings. One practice that can be found in Sweden was done by a woman in her 7th month of pregnancy. The mother-to-be would draw blood from her finger with a needle and use the blood to draw protective runes on a piece of wood, before spinning three lengths of linen thread (Viking Answer Lady, 2012). One length of thread would be left white, another dyed red, and the third dyed black, while the rune blooded wood would be burned and the ashes added to beer or mead (Viking Answer Lady, 2012). The sections of linen thread were burned apart into 7" threads using a brand from the fire, soaked in boiling salt water, and then left to dry in the branches of a tree for 3 days (Viking Answer Lady, 2012). The threads were carefully saved until the day of the birth when the black threads, representing death and bad luck, were burned and the ashes buried, the white thread was used to tie the cord at birth, and the red was strung with a bead [probably amber] and tied on the baby's wrist for protection (Viking Answer Lady, 2012). This one would actually work just as well in a modern context, although I suppose for those of us that don't spin we would have to buy the needed thread/yarn. When it comes to birth there are several practices for modern people that are based on older folklore and mythology. The Troth, for example, suggests making a prayer and offering to Frigga and the disir at the onset of labor (The Troth, 2007). Silver keys are cited as a common charm for childbirth, using the symbolism of unlocking the birth passage and encouraging a speedy and easy birth (The Troth, 2007). A common plant used to make the bed for childbirth is called "Freyar gras" (Freya's Weed) associating Freya with childbirth as well, so that a laboring woman might call on Frigga, Freya, and the disir for support and aid (The Troth, 2007). There is a strong folk tradition in both Germany and Scotland that all doors should be unlocked, as a locked door could block the birth process (The Troth, 2007). The mother might also choose to wear keys, perhaps as jewelry, during labor and should also be sure to untie and unknot everything that she can in her room as knots are also thought to delay or complicate the birth. Even the hair might be kept loose to avoid any possible ties or knots. There are also runes associated with childbirth. In Sigdrifumal it says: "You shall know birth runes, if you would give help in birthing, and loosen a child from the woman. You shall rist them on the palm, and on the hand's span, and bid the disir's aid." Of course the actual birth runes being referred to are unknown now but different modern authors have suggested possibilities. Perthro and Berkano are often mentioned as birth runes, and it is possible to make a birth bindrune using Perthro, Berkano, and Laguz, with Perthro opening downward to indicate an open passage for the child (The Troth, 2007). Naudhiz is also mentioned as a birth rune, being associated with need and with the Norns; I have heard it suggested to draw nauthiz on the hands or even paint it on the fingernails to aid in birth. Otherwise the runes chosen can be drawn or traced on the hands of those helping and on the abdomen of the laboring woman. to open my limbs and my members." (Ellis Davidson, 1998). to open my limbs and ease this birth." There are different folktales, such as Sleeping Beauty, that reflect the older heathen ideas about the way that the Norns could effect the fate of a newborn. In modern practice perhaps a person would want to hold a blot or similar type ritual to the Norns after the birth to ask for blessings and good wyrd for the baby. It might also be worth considering setting up a small altar to the Norns during pregnancy for a similar purpose. It would be traditional to keep the placenta and bury it near a tree (Viking Answer Lady, 2012). For a modern heathen this could perhaps be done instead by planting a new tree over the placenta. Additionally a modern heathen might choose to adapt the American custom of the baby shower by setting up a small altar to the Norns and asking each guest to offer a blessing for the baby, perhaps written on a piece of paper that could be placed on the altar. This sort of petitioning the Norns for good wyrd for the baby would reflect the older idea of the Norns as weaving the new child's wyrd. About a year ago I had begun thinking of getting a staff to use with seidhr work. The seidhrkona in Eric the Red's Saga used a staff and several modern practitioners have mentioned using one; I found the idea intriguing and was contemplating working it into my own practice. I have a couple staves already, but none of them felt right for use in seidhr so I was tentatively thinking of making my own, a daunting prospect given my past failures in that area. I'd been debating back and forth with myself for several months actually about using or not using a staff and making one or not and hadn't made any firm decisions, when in late January of this year I saw a link to an e-bay listing for a staff by Paul Borda. I can't accurately describe the intense and immediate feeling that this staff was meant to be mine. It was overwhelming. I had never been on e-bay before and I had an ingrained mistrust of any online auction sites but I followed the link like Alice diving down the rabbit hole. The staff was beautiful, and it was perfect. Made of ash wood it was intricately carved with an image of Odin, his two ravens, his two wolves, Sleipnir, and the rune ansuz. Odin was holding a horn (I imagined of mead) in one hand, and his spear Gungnir in his other hand. The detail was stunning and I was in love. The price however was prohibitive, so I sadly told myself it was not to be. The auction ran for a week. Every day I found myself obsessively thinking about the staff in a way that was not normal. I couldn't get it out of my mind and I found myself fighting the temptation to place a minimal bid on it, even though I had bills to pay. Finally I started to wonder if this was all me or if some of this was rooted in Odin wanting me to have the staff - I realize how that sounds but at this point I could not explain why I was so obsessed with it. The more I thought that it was something he wanted me to have, the more sure I became that it was so, but the rational part of my mind kept interjecting that it could just be my own desire. Why, afterall, would a deity care what kind of a staff I used, even if I was dedicated to him and it was for work I do because of him? I am fond of beautiful things, and it could just as easily have been my own desire talking. Finally I thought of some advice I'd been given years ago by another seidhrworker and Odinswoman that I very much respect. She told me that sometimes the Gods may want us to do certain things for them, and in those cases there is nothing wrong in asking for their help in getting what we need to accomplish what's being asked of us. I thought long and hard about this, and about whether there was any possible way I could get the needed money. My family had just filed our tax return and I knew we had some money coming back; this is the only real spending money of any quantity that I have during the year and I already had a list of books and other items that I was planning to get. But I also knew that it had always taken at least 2 weeks for the tax refund to show up in our bank account and that would be long after this auction closed. It seemed impossible for me to work this out on my own in any way. That wednesday I stood before my altar, lit a candle, and made a small offering. I asked Odin, if it really was true that I was meant to have this staff or that he wanted me to have it for my seidhr work, that he help me to have the money in time. In exchange I said that I would spend every penny that I had for spending money if it came to that, to try to get the staff, and forego all the other items I had wanted to get. I walked away feeling like it was out of my hands now, one way or another. The next day when I checked my bank account (to balance my checkbook) the tax return money had been direct deposited. A record 3 days after filing the return. It freaked me right out. I actually went back and triple checked it to be sure it was really there. And then I remembered my end of the agreement and went up and placed a bid on the staff, which I won two days later when the auction closed. Even now telling the story it seems unreal, but that is exactly what happened, the way that it happened. And I have had the staff ever since. The biggest lesson I got out of this was that it really is okay to ask the gods for help when we feel that they want us to do something. If they really want it then they will help with it (obviously how to tell what they want is an entirely different topic). In the past when I felt that something was wanted of me I always took it as a personal challenge. It is hard for me to ask for help, even divine help, because I always rely in myself to get things done or to work things out, so this was probably a lesson I needed to learn. This last one was inspired by my oldest daughter, who last year mis-heard the lyrics to "Come All Ye Faithful" and was singing instead "Oh come we'll honor Odin" in the car. I've taken her idea and expanded it to the full song. Grant us guidance each day! Sing we all together to him! Grant us strength each day!